I first read about El Pecas #2 on the LA Chowhound forum. It got rave reviews and since I'm a taco reporter I decided to take a closer look. 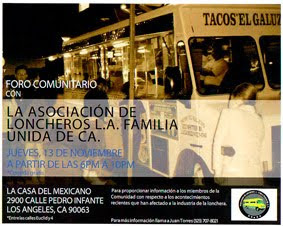 Parked at the southwest corner of La Brea and Olympic El Pecas #2 serves up tacos and burritos with a smile. Well maybe not a smile, more like a half smile. Not only do they serve of tacos but they also have a TV mounted on a wall inside the truck that plays your favorite mexican soap operas and talk shows. You can't hear the audio but you can stare at the TV and pretend you understand what is going on while you wait for your tacos. I ordered my usual of asada and al pastor. 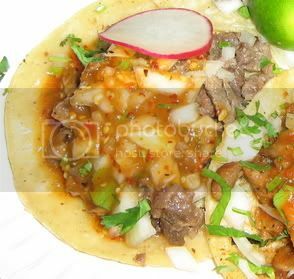 "Dos tacos de asada y dos de al pastor con todo por favor" The al pastor is cooked on a slow roasting spit which is a rarity for taco trucks but always a welcomed surprise. My tacos came with onions, cilantro and a subtle yet spicy salsa roja. The al pastor was delicious and saucy with carmalized onions and spiced cuts of pork. The asada was equally pleasing with tender fine cuts of beef on top of perfectly oiled corn tortillas. I'm not sure how long El Pecas has been parking at this location but I hope they start to get a following. These guys are on to something and really know how to satisfy a taco craving. I can see this being a late night before or after club hangout on the weekends with the ample parking space and it's location. Delicious delicious tacos and I hope El Pecas #2 gets rewarded with crowds of patrons. Their pastor burritos make me wet my pants with joy. I would be interested in your opinion of Tito's Tacos. I live around the corner from them and don't think they're all that. But I'm no taco authority! The joy of Tito's is not in the tacos themselves, which are somewhere between mediocre and terrible. 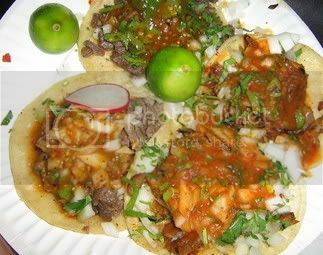 Rather, it lies in the sublime experience of participating in a ritual in which several generations of Angelenos have preceded you, and marveling at the endurance of such a place--a crappy taco stand without chairs!--in a city that relentlessly reinvents its built and cultural environments at breathtaking speeds. Titos is nostalgic.I loved their tacos as a kid but I probably eat there 3 times a year now. Now when I go I order a regular burrito with cheese double wrapped. El Pecas #2 is indeed well-rewarded, as I saw when I passed by there at ~11:30 last night and saw a crowd. 11:30 on a Monday night! I hope they eventually make enough money to open an actual taqueria, with a bathroom and chairs and maybe some bovine taxidermy on the walls. I stopped by El Pecas #2 this evening. Or more to the point, tried to. They weren't there. Not sure if this was temporary or permanent. I hope the former as I liked the tacos al pastor I had on my last visit. OH. MY. GOD were the pastor tacos I ordered tonight amazing. And then, to finish it off, onions slathered in salsa. This may be the best taco truck in the city. Went there on 7/3 after the Hollywood Bowl. AWESOME tacos. I probably go to this place on my way back from at least 3 times a week - I'm completely addicted! I love the grilled green onions they serve on the side - simply delicious. 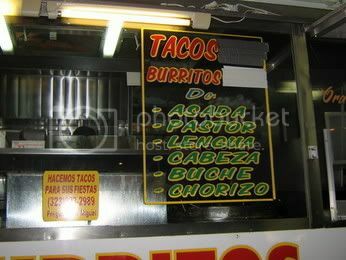 From all the tacos trucks I've tried (I've tried all your top recommends, my dear Bandini) this one's the best. Let the lobbying for a 5-taco rating commence. went there on 11/27/06 and they're not there anymore. Been replaced by another truck. El Chato. I would have tried them, but they weren't serving yet at 8:15. El Pecas #2 has changed their name to El Chato. New taco wagon. Same great tacos. El Pecas (not sure which #) is located on the corner of 7th and Soto at a small coin-op car wash. so maybe they did move! 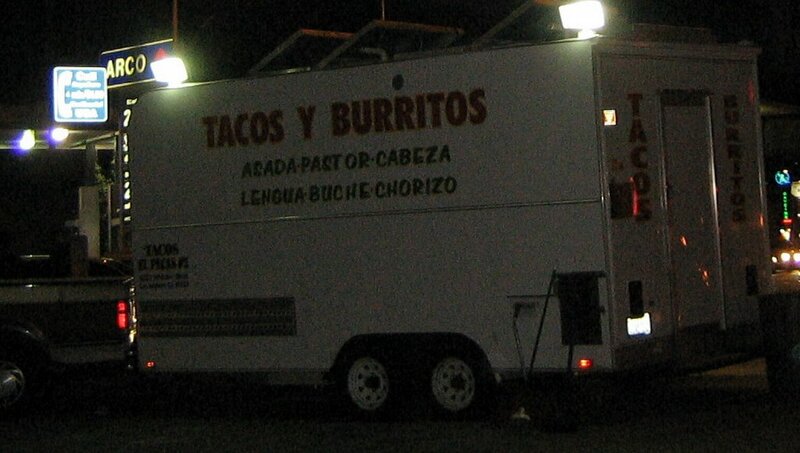 I tried them last night and was impressed with the carne asada, cebollas, and peppers. washed it down with some jamaica and you are good to go!